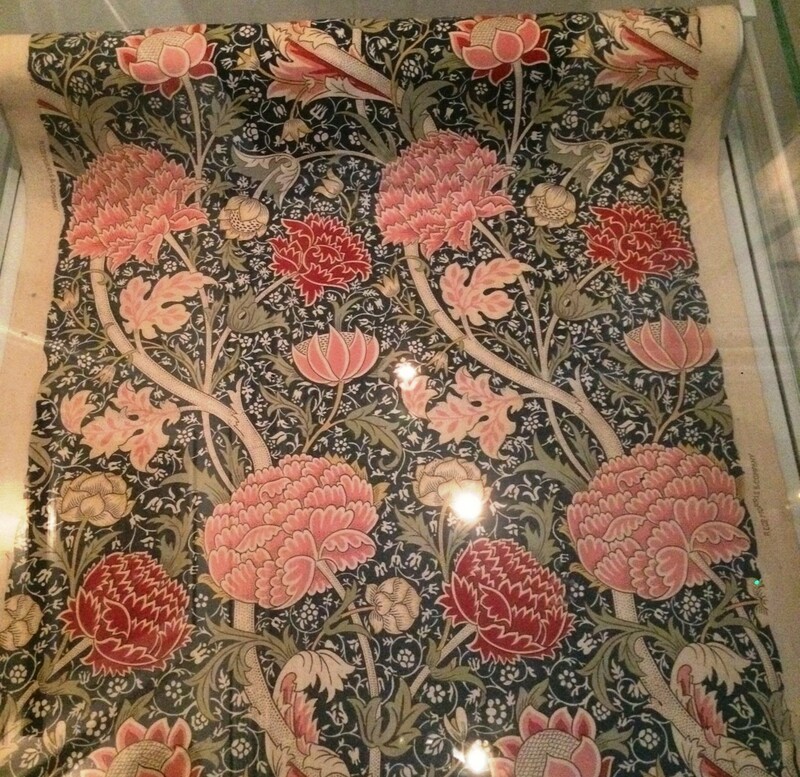 A few weeks ago I went on a trip to the William Morris Gallery in Walthamstow. In the middle of Lloyd Park sits a beautiful a grand Georgian house, and is entirely dedicated to the celebration of the Arts and Crafts designer. The house, the work and the atmosphere all make it well worth a trip; here are some of my highlights. The gallery is filled with William’s best and brightest work, from the beginning and end of his life, and continuing after his death as his company Morris & Co. lived on, and still continues today. 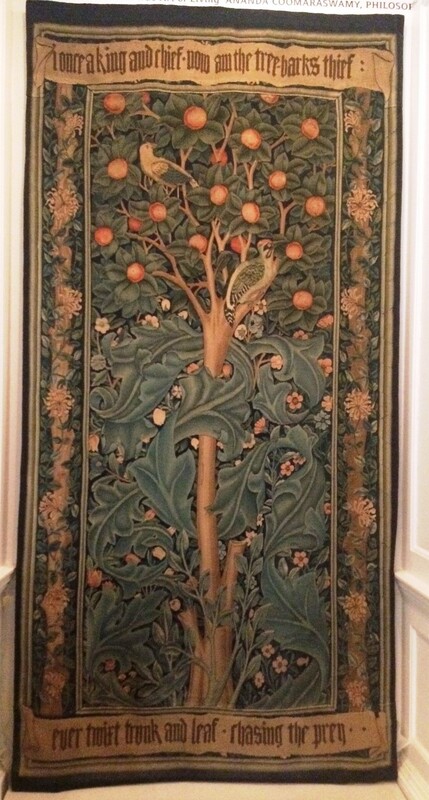 The tapestry below was a rather unique piece in the collection, and although it was made in 1885, it has a very medieval quality to it, and is an ode to Morris’s love of storytelling. 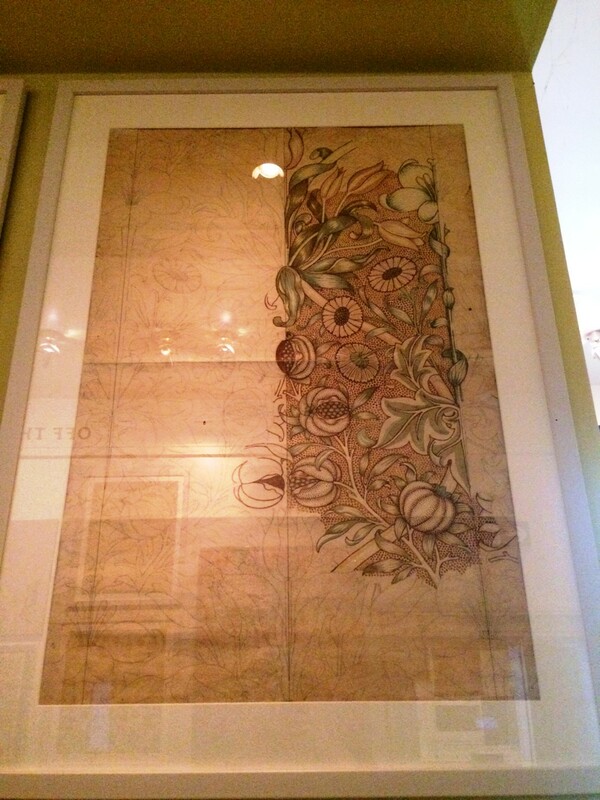 This intricate, floral design was created using natural vegetable dyes and needed thirty-four different woodblocks to complete the finished look; showing the dedication that Morris and his team put into their work. 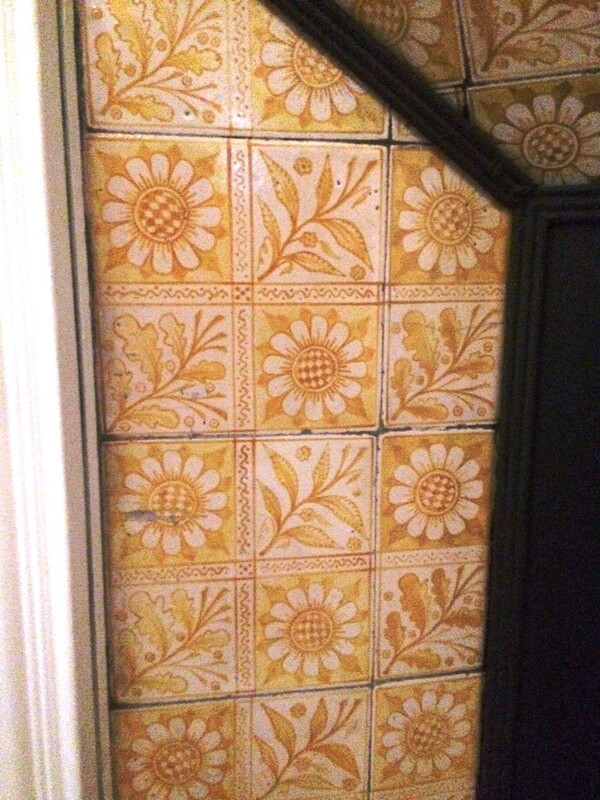 There are all sorts of different pieces on display at the gallery, including this fireplace surround, which is beautifully decorated with Longden tiles in a sunny yellow, which have been attributed to Philip Webb who worked closely alongside William throughout his career. 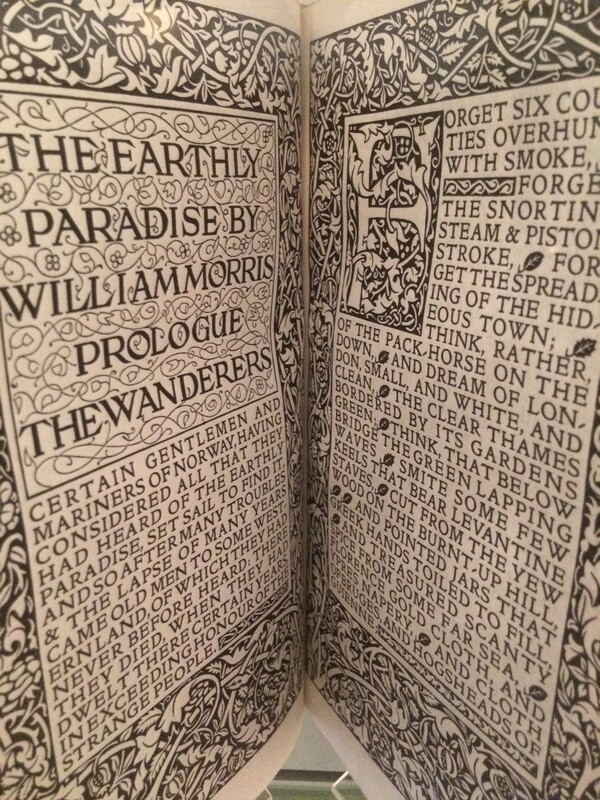 If you know William Morris, you’re probably aware of his ideologies that contributed to his style of work, and his return to art forms prior to the Victorian era. Morris created his work in protest to the industrial revolution, and the way it treated the workers as well as the quality of the work that was produced. 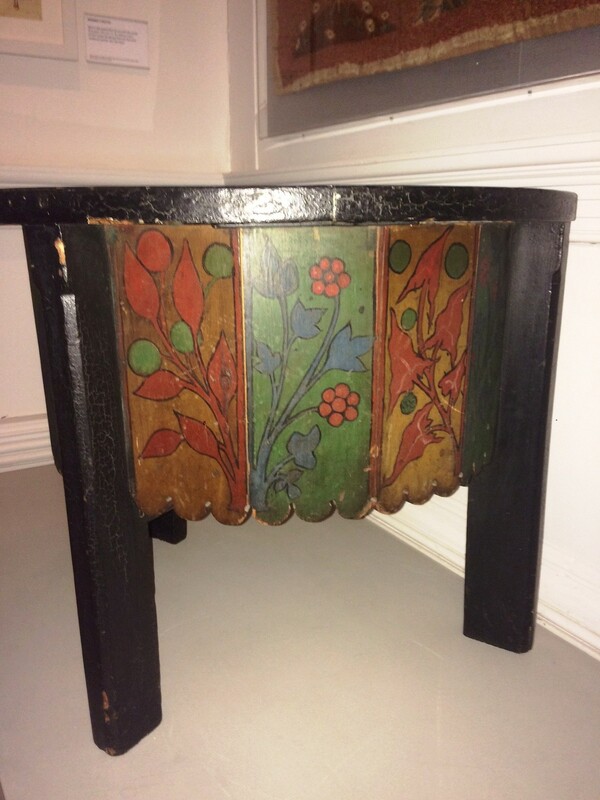 Here, Morris designed this chair for his lodgings in London, and its style reflects a medieval style with painted panels; which was an era that Morris much admired. 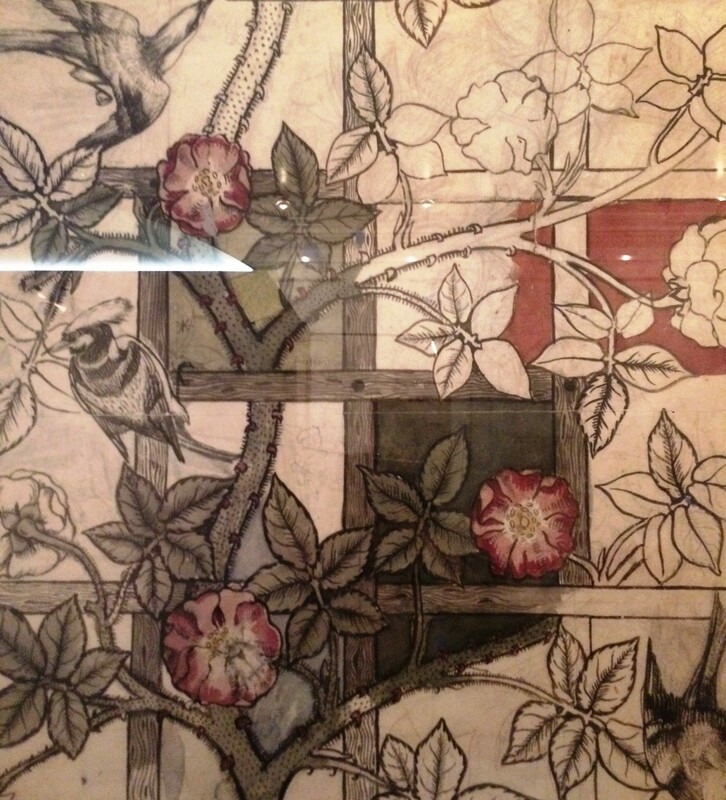 The gallery also featured a segment from William Morris’s first wallpaper design, Trellis, which also reflected his love for medieval art once again, and was based on a medieval style walled garden he had created at his home, Red house. 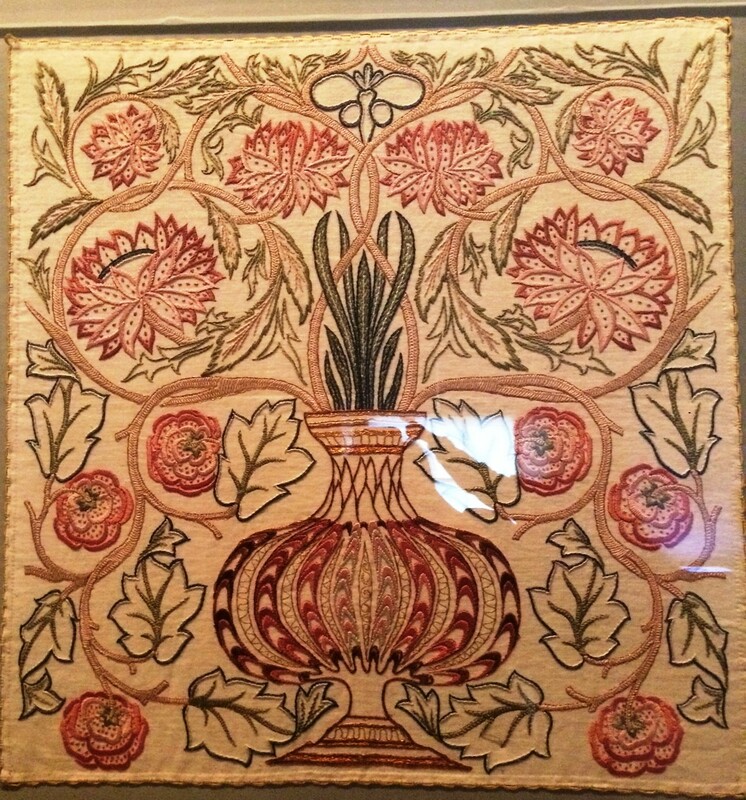 This Flowerpot embroidery, was an affordable design which proved very popular, and was made by May Morris, Morris’s very talented daughter; the design looks like it was perfectly made for a feature cushion. 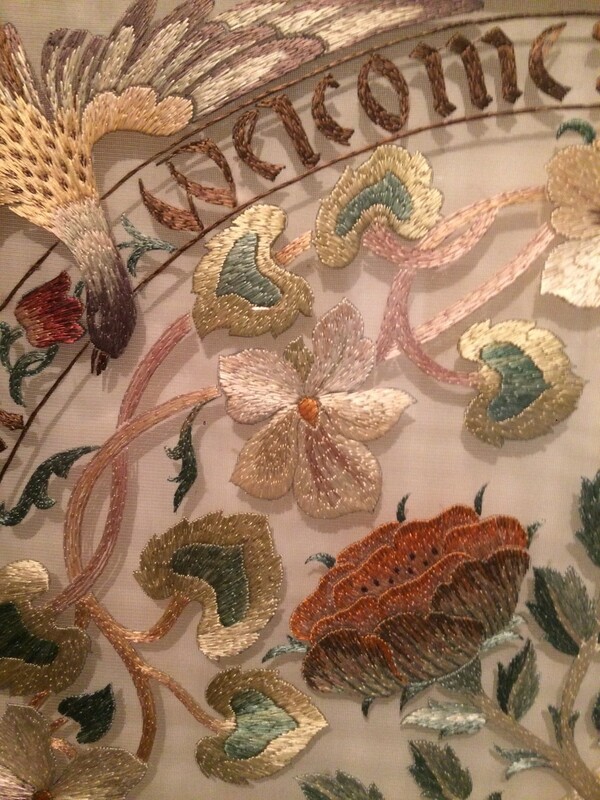 May Morris, William’s daughter also had her own career as a designer and an embroiderer; and had an exhibition at the gallery as well. Her work was absolutely glorious, full of light and elegance. This piece is absolutely luminous; there’s a delicacy it is and softness that is different to her father’s work. This design was by far my favourite thing in the whole gallery. 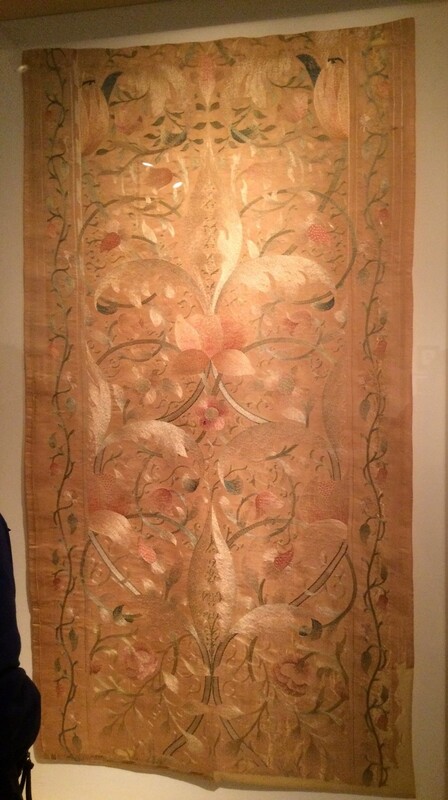 Intricate embroidery on a sheer silk background, shows off not only style but skill. The golden thread still shimmers today, holding all of its life even after all this time; it’s a truly breath-taking piece. 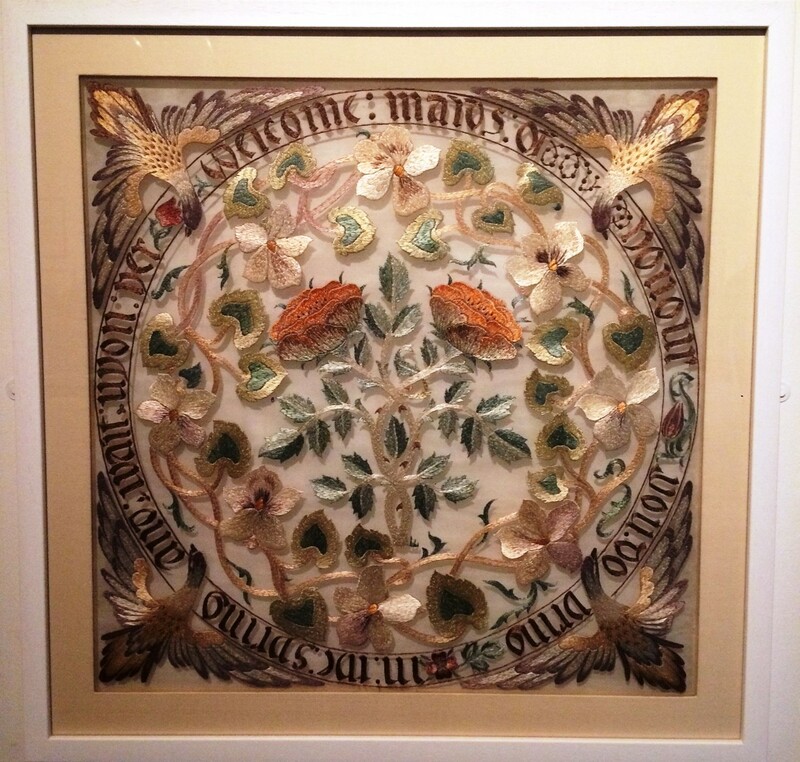 Written on the wall in May Morris’ exhibition is a quote by her in her later life saying “I’m a remarkable woman – always was, though none of you seemed to think so”, which I thought was rather brilliant. Under the shadow of her father and his company, May Morris shined, although not in her own name, but today she get the celebration she deserves, and she truly does deserve it. Hodsoll McKenzie is one of my favourite fabric companies, every collection is filled with glorious colours, embroidery work, textures and of course wonderful designs. So it comes as no surprise that their new collection Discovery is just as lovely as ever. The collection has new design techniques and ideas that introduce “an unexpected twist to natural fibres and inventive interpretations of classic and ethnic designs”. Discovery is full of soft and sumptuous designs that have the perfect combination colour, subtly and romance. So take a look at the latest instalment from Hodsoll McKenzie. The beautiful Turlington fabric has a Tuscan antique sensibility to it. The faded glamour of the pattern gives off a relaxed and calming presence; you’d be able to have this look in a contemporary bohemian setting and have it feel just as at home as in an older, more traditionally styled home. The embroidery on this Gabon fabric designs is absolutely stunning, creating patterns that take their influence from African design. The strong sharpness of the indigo background allows the pattern to pop, while still keeping a natural and organic feel to the cloth. The drapery in this next photo is a lovely fabric that hangs beautiful. The Quincey Floral pattern was taken from an 18th century design, so it perfect if you want to create an inviting, classic setting in your home. Also featured is the Donnelley fabric on the central cushions. A rustic design taken from the Scottish Highlands; which could be a fun alternative to tartan if you want to evoke that heritage feel in a different way. The upholstery on this chair is the Malindi fabric, named after the city in Kenya. The intricate pattern has both a softness and a richness to it, making it feel like it would be comfortable both in your home and a hotel. If you’re more inclined to opt for a plain upholstery fabric, something textural like this Collins design from the collection is a gorgeous way to have the best of both worlds. There’s an interesting effect on the fabric that’ll give your sofa a bit of life. Also in the image is the Chloe braid on the cushions, which is a great idea to dress up the piece in a glamorous way. I absolutely love this velvety patterned fabric, it has a distinct Renaissance feel to it, whilst the use of the denim colour gives it a modern feel as well. It looks beautiful on chair above, but I can also see this looking lovely on a headboard, really creating a statement in a room. The stripe of the Serengeti fabric gives the sofa above a beautifully elegant feel. It’s a perfect example of how you can have a patterned sofa and still have a collection of vibrant and busy cushions on top of it without them clashing. The centre cushion shows the Gabon fabric in a smaller way, for a more intimate approach to the pattern; great for using in any room of the house. It’s always lovely to see a collection like this where you can imagine using every fabric, from stripes to patterns to plains, there’s a whole array of exciting pieces to choose from, the only trouble now is picking a favourite.